Thomas Walsh discovered fabulous wealth at the Camp Bird Mine near Ouray, Colorado. No one except Walsh thought to check the mines for gold at a time when the San Juan Mountains were silver country. When he learned the fabulous results of his secret assays, he whispered to Evalyn, "Daughter, I've struck it rich." Daughter Evalyn went on to lead a fabulously rich and extravagant life after she married Edward Beale McLean, whose family owned The Washington Post. They threw spectacular parties, entertained kings and presidents, and lived in huge, grandiose homes. Edward bought Evalyn the Hope diamond, but the "curse" of the diamond struck their family too. Tragedy struck, and struck hard. A son died and the family fortune was lost. 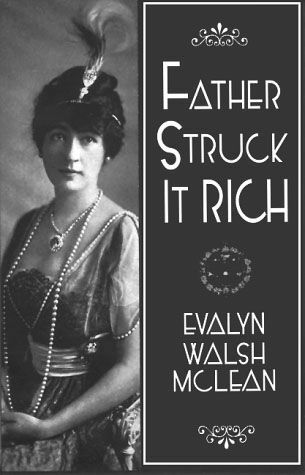 Father Struck It Rich takes the reader from humble times to unbelievable riches and then through tragic bad times.